Total Disclosure: I paid full price for all the bars. The only compensation I received from the company is free shipping for a first time order (and you can get that by contacting the company for the code for free shipping for a first time buyer). It should be noted that I normally do not like or choose Stevia as an ingredient in my foods. This product line was a revelation. Stevia can be used in a manner that does not leave an aftertaste. I am impressed. Great taste. Heavy favorite of my daughter, the coconut-Nut. I liked it. It had a good aroma, pleasant texture and no nasty aftertaste. Nothing to dislike in eating this bar. I would buy it again. After effects: None. No craving for more. No gas. 20 g Protein 24 Carbs, 17g Dietary Fiber, 6g Fat, 6 g Sugar Alcohol, 270 mg Sodium, 2 g Sugar (not added - this is naturally occuring sugar). Sweetened with Erythritol and Stevia. 170 calories. Great taste. Heavy favorite of my husband. My daughter, the coconut-Nut. I liked it. It had a good aroma, pleasant texture and no nasty aftertaste. Nothing to dislike in eating this bar. I would buy it again. After effects: No craving for more. No gas. 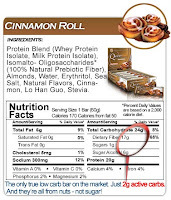 20 g Protein 25 Carbs, 17g Dietary Fiber, 5g Fat, 5g Sugar Alcohol, 270 mg Sodium, 1g Sugar (not added - this is naturally occuring sugar). Sweetened with Erythritol and Stevia. 160 calories. Tasting has continued with the Cinnamon Roll, Lemon Cream, and Strawberry Cheesecake flavors. Smell, taste, texture all good. No nasty aftertaste. 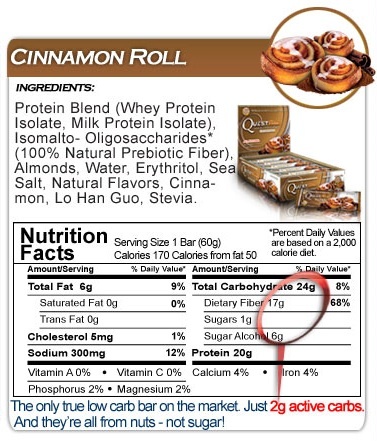 The Cinnamon, which also has only 1g naturally occurring sugar, was so good I took the first bite out of my mouth and went back and re-read the label to make sure yet again that it did not contain butter or milk fat. It tasted so buttery I had to triple check before eating my portion without fear I was bathing my mouth in butter. The Lemon cream is light and refreshing - like a spring or summer day. The strawberry cheesecake was the only one I have given a warning flag. The taste is excellent. There is nothing wrong with the bar itself. The problem is in me. It tastes too much like a favorite dessert that is no longer in my life. I want to make sure this particular bar does not set me off. More will be revealed in the future and I will update if it is warranted later on. I also ordered an assortment of the bars that do contain the artificial sweetener used in Splenda. I wanted to try these if the sugar alcohols in the all-natural bars caused any gas issues. That didn't happen so I will not be rushing to try them until my family has finished the natural bars. Yes, I bought them for me but upon trying them both husband and daughter have asked to take them for the days when they cannot get to their meals as planned, which is the only reason I wanted to try them. Again, my use of these bars will not be for 'dessert'. That just leads me down a slippery slope. They will not be a treat or an everyday item on my eating guide. They are for the days I travel or work where I cannot have access to my planned meals. I am grateful to Myra of Downsizers for recommending Quest Protein Bars. As of today, they fit every need I have for a bar: no soy, no wheat, no added sugar, no milkfat, low sugar grams, high protein and high fiber. I am adding these to my war chest of tools in the ever going quest to be keeping the pounds off. Could these bars help you on your schedule challenged or travel days? These sound great - and I was one click away from buying a few of the all-natural to try... but I just don't think it would be a good idea for me right now... still a little "fragile" if you know what I mean. my middle has liked all she has tried, I think strawberry is her favorite so far. she is using them the same way - no time, no accessibility GO TO item. Thank you for this review. I was so excited to see that they were gluten free, low carb (unlike Lara bars and other gluten free bars), and (I thought because I misread), milk free. Unfortunately, my nursing baby appears to react badly to milk protein, so I will have to file the name of this product away for when I can eat it again. These look like a wonderful option for those crazy days. Life is better today. Wait until you are ready because of need - not because you want a substitute for missing dessert. Good News. I have been wondering what you thought of them. I have been in the car a lot on a longer route while a new guy is trained and one of the bars has been my lunch every day. They are so portable, nutritious, and filling. I always have them on had. The strawberry one doesn't tempt me at all. Found these and have one daily. I have low blood sugar and need a boost mid morning and afternoon, but I also have a huge sweet tooth. These conquered both problems, stable blood sugar, satisfied craving without a "crash" later.